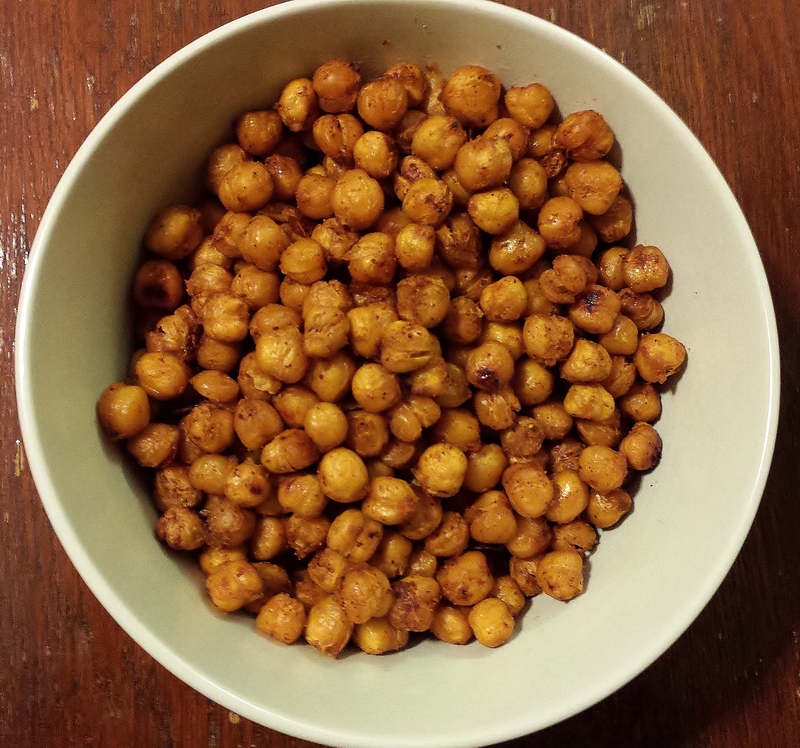 I’ve been wanting to try making crispy oven-roasted chickpeas for a while now. It was just a matter of dreaming up the perfect flavor to try. Chili-lime was the idea that stuck with me, and I have to say, it turned out to be a pretty delish one! The rich savoriness of the chili and garlic powders, the vibrant tang of the lime juice, and the slight heat of the cayenne pepper meld into an addictive explosion of flavor. And because this snack is made with chickpeas – which, as legumes, are a naturally great source of protein and fiber – and is oven-roasted rather than fried, you can feel good about indulging. A note about cooking time: in researching how to roast chickpeas online, I found most recipes recommended doing so at 400 degrees for 30 to 40 minutes. For my first batch (I made two), I roasted mine for 45 minutes, and I think I could count on one hand the chickpeas that I found in it that were actually crunchy. But then again, my oven is kind of f@!ked. It often takes much longer than recipes I am following tell me it should to cook something properly. This mostly affects the baking of heavy breads or cakes, but sometimes it hinders other items, too. So with Batch Number Two, after 45 minutes, I started checking it periodically, testing the chickpeas until I found they were the desired crunchiness. I ended up cooking them for an hour and five minutes! They were nice and crunchy then – well, maybe almost too crunchy. The flavors were just not as distinctive when they were that well-done. So I would recommend cooking the chickpeas for 40 minutes, and then if they aren’t your desired doneness, cooking them in five-minute intervals until they are. Drain and rinse chickpeas well in a colander. Rub excess water off of them with a clean dish towel or a few sheets of paper towel. Pick out any loose skins that you spot (but don't make yourself crazy doing it. A few chickpea skins mixed in won't hurt anything). Add the chickpeas to a large bowl and mix with oil, garlic powder, chili powder, cayenne pepper, sea salt, and lime juice. Transfer to a metal baking pan and cook for 40 minutes, shaking or stirring the chickpeas at the 20-minute mark. Test chickpeas after the 40-minute mark; if not the desired doneness, keep cooking them in five-minute intervals until they are. Then enjoy as soon as they've cooled enough to transfer into a bowl. You can store leftovers in an airtight container; they will stay fresh for a day or two.